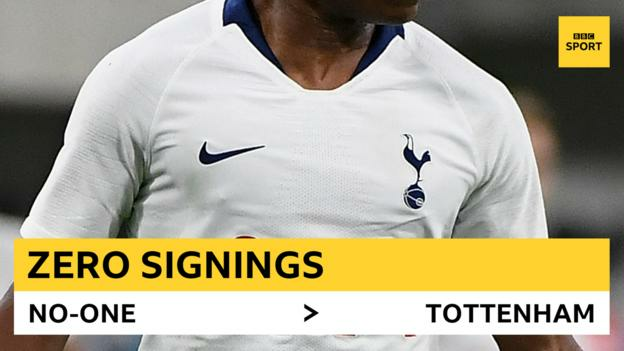 Pochettino and striker Harry Kane signed new long-term deals this summer. "I am not worried, I am not sad - I am so happy," said Pochettino, whose side were the only Premier League team not to add to their squad. But the Tottenham Supporters' Trust said they want "a full and credible explanation of what has happened". Pochettino could still lose players to overseas clubs as the deadlines for Europe's other majors leagues are later in August. But the Argentine said: "We have a very good squad, we have very good players and it is not easy to add players that improve that. "Of course we didn't sell players and with 25 players in the squad it's difficult to add. "Our targets are always in the same level of Real Madrid or Manchester United or Manchester City, but for different circumstances we cannot achieve that. "If you cannot add players who can improve your squad, the most important thing is to make sure you do not lose your best player. "And I think that was a great job from the club to keep the best player and keep the manager." Tottenham made a £25m bid for Aston Villa midfielder Jack Grealish, but were unable to conclude a deal. Despite Pochettino's positivity on the eve of a new season in which Tottenham will play in their revamped stadium, the club's supporters want answers from chairman Daniel Levy. A statement from the Supporters' Trust said: "We are told that we don't have to sign players because we develop our youth. Yet four of our most promising prospects left the club this summer (Reo Griffiths, Anton Walkes, Keanan Bennetts and Noni Madueke.) Of the current first-team squad, just two regulars have come up through the ranks. "We love what has been developed, but for all the great football we've seen over the last few seasons, there are no trophies to show. "We have the highest-paid chairman in the Premier League. Our fans pay some of the highest prices in world football. Our support for our team and our admiration for what has been achieved remains strong. However, we believe fans are entitled to a full and credible explanation of what has happened this summer." Tottenham have achieved three consecutive top-three finishes and have retained all their first-team players, despite reports linking Kane with Real Madrid and defender Toby Alderweireld with Manchester United. As well as Kane's new five-year contract, there have been extensions for Son Heung-min, Erik Lamela, Davinson Sanchez and Harry Winks. Former boss Harry Redknapp believes the problem for Pochettino is that his first team is so strong that new signings are unlikely to disrupt a settled XI and may have to settle for a place in the squad. "They have so many good players and their starting XI is fantastic, but they also have good cover," Redknapp told BBC Radio 5 live. "The fans would love to have seen one or two news faces come in but the scouting system is excellent and they have not found anybody they feel can make a difference." The club's new £850m stadium will seat 62,000 spectators and be the second biggest club venue in England behind Manchester United's Old Trafford. Former Tottenham winger Chris Waddle believes that is a key factor in their approach to transfers this summer. "Tottenham have got the stadium to pay for so they will want to get through this first season and then next year they can probably invest in the transfer market a lot more heavily. "But they will think that first of all they need to get themselves sorted out first in the new stadium and get themselves going, make it a fortress and then next year really have a pop."